In association with Analogman guitar effects, Andy Powell and Jim Weider will be conducting a guitar Master Class. Andy will be demonstrating his own style, influenced by music from Surf, Blues, Folk and Rock, and Jim will demonstrate styles from Rock-a-Billy to electric Country Blues to Blues Rock. They will also be demonstrating dual lead guitar playing. Door Prize : BIG-T pickup! 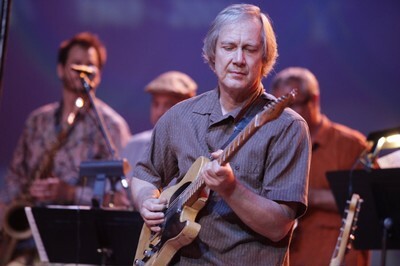 Jim Weider is a guitarist best known for his work with The Band. He joined the reformed version of The Band in 1985 to replace original guitarist Robbie Robertson. A native of Woodstock, New York, Weider was born in 1951 and began playing guitar at age 11. Some of his early influences included Chuck Berry, James Burton and Scotty Moore. While still a teenager in Woodstock, he became acquainted with Levon Helm and was exposed to The Band's music. Weider went on to become an accomplished studio session player in cities such as Atlanta and Nashville, but eventually returned to Woodstock and was invited to become The Band's sole guitarist in 1985, remaining until the group's dissolution in 2000 following the death of Rick Danko. Jim played with Levon Helm Band at the Midnight Rambles at Levon's studio and on the road, and will continue on with the band in memory of Levon. Jim also has a guitar groove band, PrOJECT PERCoLAT0R, which has albums and live shows, and members of Levon's band join Jim for BLUE CHICKEN for fun shows. Jim is a master of classic Telecaster, still playing the '52 Tele that he has used for decades, and traditional blues slide guitar techniques. He is one of a select group of musicians to have an endorsement from Fender, and has built an international reputation among fellow musicians worldwide. For Homespun Video, Jim has produced six of the internationally distributed company's best selling instructional video tapes/DVD's : Get That Classic Fender Sound, Rockabilly Guitar (two-DVD set), Electric Country Blues (two-DVD set), and his 2000 release, Basic Licks and Classic Solos for Electric Blues Guitar. Jim will be teaching a complete overview of all his Video's covering The Roots Of Rock In Roll and how he gets his favorite Telecaster Tones ! Jim & Andy will Perform together to demonstrate their techniques and how to play with another Guitarist !! 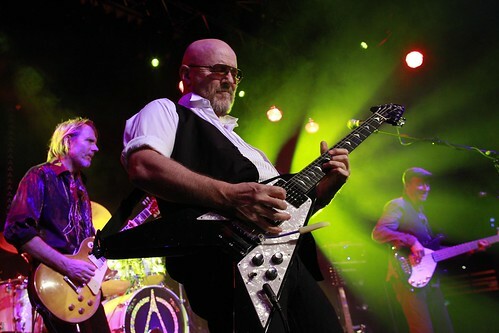 Andy Powell is a founding member of the highly respected UK classic rock band Wishbone Ash. Born in 1950 and like Jim Weider, started playing guitar at age 11. In his teens Andy Powell actually built his own electric guitars. A Connecticut resident since the 1970s when he first moved here as recording artist with MCA Universal and later, Atlantic Records, Powell and Wishbone Ash even recorded an album in Connecticut, titled New England. With 43 years of experience recording and touring under his belt, there is no situation in rock that Powell has not experienced, from playing clubs and theaters to large stadiums. A brief period of session work in the 1970s even saw him play with Beatles George Harrison and Ringo Starr. The Wishbone Ash classic twin lead sound has often been copied but never surpassed. With over 23 studio albums to its credit plus many live albums, Wishbone Ash has certainly influenced bands like Ireland's Thin Lizzy and heavy metal outfits like Iron Maiden and Judas Priest. Wishbone Ash has most definitely taken it further than most, as acknowledged by the UK music press and later Rolling Sone magazine after the worldwide success of their 1972 classic album Argus. First introduced to US audiences as opener on the Who's Tommy tour, Wishbone would later play stadiums and arenas in their own right with many US acts opening for them, like ZZ Top, Bob Seeger, Aerosmith and even the Boss, Bruce Springsteen. Andy is most closely associated with the Gibson Flying V guitar, though as a once-avid collector, he has owned just about every kind of electric guitar including, of course, Fender and Gretsch. Like Jim he owns a 1952 Telecaster which he's played as well as the Flying V on virtually all the Wishbone Ash albums. As a teenager Powell was first influenced by the music of the Shadows in the UK, in particular, the twang of Hank B. Marvin. Instrumental rock, folk rock and then later all the sounds from the States - Stax, Motown and blues, all figured in forming the basis of Powell's style. Still playing annually in excess of 150 dates worldwide, Wishbone Ash most recently toured Japan and also South Africa. Analog Man is one of the oldest boutique effects manufacturers, and both Jim and Andy use several of their pedals, in particular, the legendary King of Tone overdrive pedal. Here are Jim and Andy with their '52 Teles during a visit to the Analog Man shop. This three hour master class will be at the Stony Hill Firehouse in Bethel Connecticut. The Firehouse is just off Interstate 84 exit 8 in Connecticut. This great location will hold 100 people, so be sure to get your tickets soon. I84 exit 8, go east on Rt 6 1.7 miles, the firehouse is on the right opposite the Stony Hill Inn pond. DO NOT PARK NEAR THE FIRE TRUCK DOORS. Park on the side of the building, or if that lot is full, go down Weed Road and park behind the fire house (2 lots behind the firehouse). Come directly into the room by side door by the side parking lot. Analog Man is sponsoring the event and will give out some SWAG, and have pedals available for purchase including some KOT pedals with slight paint defects (no waiting list!). The Analog Man shop is a mile from the firehouse and will be open to visitors for a bit at the end of the clinic. Not to be missed!!! The class is $85 preregistered, or $95 at the door. $ave by pre-registering a friend ($75 each) or two ($70 each). Please bring a copy of your paypal receipt if possible, as your ticket. A.P. photo courtesy Alan Fretten.